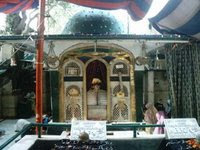 Sufi saints spread Islam in the sub-continent through their teachings of tolerance and love and gave a message of equality and brotherhood besides promotions of religious tolerance and social forbearance. Punjab Minister for Population Welfare, Ms Neelam Jabbar Chaudhry said this on the eve of Urs Bibi Pak Daman. She said that besides achieving latest knowledge and advanced technology we should also promote the message of justice, affection and brotherhood of Sufi saints. She said that due to spiritual force of Sufies, non-Muslim accepted the message of Islam in the subcontinent. She said that the real Ulema have deep respect throughout the world and we should highlight idea of love, affection and accommodation of Islam for establishment of peace in the world. She further said that Islam teaches us religious harmony and equality, therefore, we should make hectic efforts for the promotion of mutual love and brotherhood in the society.